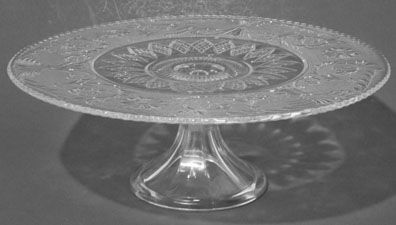 Duncan and Miller Sandwich Cake Stand, 13" circumference and 4.8" high". The Sandwich pattern was made from 1924 to 1955. In excellent condition. PS: Warning: This type of glass (pedestalled plate) does not ship well. We will put this item in an oversized box to minimize the chance of breakage. We tell people of the problems before shipping -- not after. It should be okay with oversized packaging. -- thank you.